Web Workers are additional threads that a website can create. Using workers, a website can utilize multiple CPU cores to speed itself up, or move heavy single-core processing to a background thread to keep the main (UI) thread as responsive as possible. We’ll describe WebGLWorker’s design, and how it allows running WebGL-using code in workers, without any modifications to that code. While the proxying approach has some inherent limitations which prevent us from implementing 100% of the WebGL API, the part that we can implement turns out to be sufficient for several real-world projects. We’ll see performance numbers on the proxying approach used in WebGLWorker, showing that it is quite efficient, which is perhaps surprising since it sounds like it might be slow. In both cases the rendered output should look identical whether running on the main thread or in a worker. Note that neither of these two demos were modified to run in a worker: The exact same code, in both cases, runs either on the main thread or in a worker (see the WebGLWorker repo for details and examples). Note that the WebGL-using codebase interacts with WebGLWorker’s worker code synchronously – it calls into it, and receives responses back immediately, for example, createShader returns an object representing a shader. To do that, the worker code needs to parse shader source files and so forth. Basically, we end up implementing some of the “frontend” of WebGL ourselves, in JS. And, of course, on the client side the WebGLWorker client code interacts synchronously with the actual browser WebGL context, executing commands and saving the responses where relevant. However, the important thing to note is that the WebGLWorker worker code sends messages to the client code, using postMessage, but it cannot receive responses – the response would be asynchronous, but WebGL application code is written synchronously. So that arrow goes only in one direction. For that reason, a major limitation of this approach is synchronous operations that we cannot implement ourselves, like readPixels and getError – in both of those, we don’t know the answer ourselves, we need to get a response from the actual WebGL context on the client. But we can’t access it synchronously from a worker. As a consequence we do not support readPixels, and for getError, we return “no error” optimistically in the worker where getError is called, proxy the call, and if the client gets an error message back, we abort since it’s too late to tell the worker at that point. We are therefore limited in what we can accomplish with this approach. However, as the demos above show, 2 real-world projects work out of the box without issues. Some commands are proxied literally by just appending a few numbers to an array. That can be faster than calling into a DOM API which crosses into native C++ code. Calling from the browser’s native code into the graphics driver can cause delays, which proxying avoids. So on the one hand it seems obvious that this must be slower, but there are also some reasons to think it might not be. Let’s see some measurements! The chart shows frames per second (higher numbers are better) on the BananaBread demo, on Firefox and Chrome (latest developer versions, Firefox 33 and Chrome 37, on Linux; results on other OSes are overall similar), on a normal version running on the main thread, and a worker version using WebGLWorker. 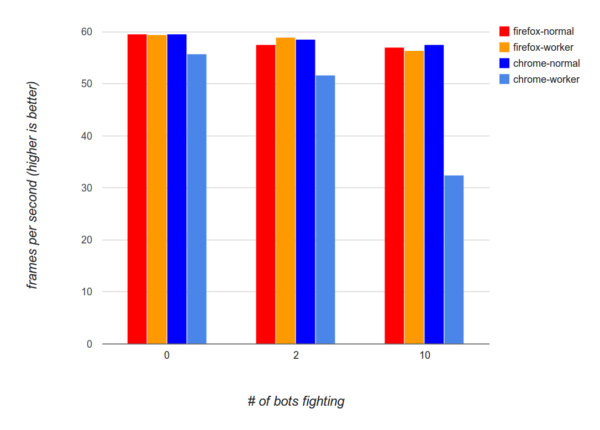 Frame rates are shown for different numbers of bots, with 2 being a “typical” workload for this game engine, 0 being a light workload and 10 being unrealistically large (note that “0 bots” does not mean “no work” – even with no bots, the game engine renders the world, the player’s model and weapon, HUD information, etc.). As expected, as we go from 0 bots to 2 and then 10, frame rates decrease a little, because the game does more work, both on the CPU (AI, physics, etc.) and on the GPU (render more characters, weapon effects, etc.). Hower, on the normal versions (not running in a worker), the decrease is fairly small, just a few frames per second under the optimal 60. On Firefox, we see similar results when running in a worker as well, even with 10 bots the worker version is about as fast as the normal version. On Chrome, we do see a slowdown on the worker version, of just a few frames per second for reasonable workloads, but a larger one for 10 bots. Overall, then, WebGLWorker and the proxying approach do fairly well: While our intuition might be that this must be slow, in practice on reasonable workloads the results are reasonably fast, comparable to running on the main thread. And it can perform well even on large workloads, as can be seen by 10 bots on the worker version on Firefox (Chrome’s slowdown there appears to be due to the proxying overhead being more expensive for it – it shows up high on profiles). Note, by the way, that WebGLWorker could probably be optimized a lot more – it doesn’t take advantage of typed array transfer yet (which could avoid much of the copying, but would make the protocol a little more complex), nor does it try to consolidate typed arrays in any way (hundreds of separate ones can be sent per frame), and it uses a normal JS array for the commands themselves. A final note on performance: All the measurements from before are for throughput, not latency. Running in a worker inherently adds some amount of latency, as we send user input to the worker and receive rendering back, so a frame or so of lag might occur. It’s encouraging that BananaBread, a first person shooter, feels responsive even with the extra latency – that type of game is typically very sensitive to lag. “Real” WebGL in workers – that is, directly implemented at the browser level – is obviously still very important, even with the proxying polyfill. Aside from reducing latency, as just mentioned, real WebGL in workers also does not rely on the main thread to be free to execute GL commands, which the proxying approach does. Proxying just WebGL isn’t enough for a typical WebGL-using application. There are some simple things like proxying keyboard and mouse events, but we also run into more serious issues, like the lack of HTML Image elements in workers. Both PlayCanvas and BananaBread use Image elements to load image assets and convert them to WebGL textures. WebGLWorker therefore includes code to proxy Image elements as well, using a similar approach: When you create an Image and set its src URL, we proxy that info and create an Image on the main thread. When we get a response, we fire the onload event, and so forth, after creating JS objects that look like what we have on the main thread. Finally, there are a variety of missing APIs like requestAnimationFrame, that are straightforward to fill in directly without proxying (see proxyClient.js/proxyWorker.js in the WebGLWorker repo). These are typically not hard to implement, but the sheer amount of potential APIs a website might use (and are not in workers) means that hitting one of them is the most likely thing to be a problem when porting an app to run in a worker. Based on what we’ve seen, it looks surprisingly practical to polyfill APIs via proxying in order to make them available in workers. And WebGL is one of the larger and higher-traffic APIs, so it is reasonable to expect that applying this approach to something like WebSockets or IndexedDB, for example, would be much more straightforward. (In fact, perhaps the web platform community could proxy an API first and use that to prioritize speccing and implementing it in workers?) Overall, it looks like proxying could enable more applications to run code in web workers, thus doing less on the main thread and maximizing responsiveness. FYI in Blend4Web the Bullet/Asm.js physics engine (called uranium.js) is running in the separate Worker too. Cool. This will allow headless, off screen rendering. This would still require a functioning WebGL context somewhere else, in order to render graphics. You *can* run your app in a headless environment, but it’s output is a stream of WebGL commands, not pixels. If that’s what you want, though, then it would work right now. One interesting use case is you could run a WebGL application in node.js on a server, and stream the render commands to the client’s browser which renders them. That is, run on a distant machine instead of in a worker (in both cases the interface is asynchronous so it should work ok). Why does the game slow down in fps at all when adding a few bots? Unless you’re at 100% CPU, which seems unlikely, shouldn’t it be locked to vsync? And if not locked, shouldn’t it run faster than 60 Hz? Browsers limit the refresh rate to 60fps. The numbers shown there are averages over time, what happens in practice is that even with 2, it is mostly at 60fps, but now and then the 2 bots cause enough explosions and other costly effects that it drops to significantly below 60fps, briefly. And this happens more often with 10 bots. they argue that one can offload non-rendering tasks to workers instead of offloading rendering tasks to workers. i am in the middle of writing a complex 3D-multiplayer game for the browser and currently i am trying to offload non-rendering tasks. so the game-logic runs in the worker and gets rendered in the main-thread. for what i can say until now: “it works”. though with the webgl-worker i would save some perf theoretically i guess, since i dont have to “proxy” the network from the main-thread into the game-logic-thread (since websockets dont work in workers in firefox, yet). Thanks for the link. I agree with their position that use cases are needed before doing serious work, but the demos here are valid use cases in my opinions – entire WebGL-using applications/engines that we want to run in workers. Splitting out the non-rendering parts is hard. I’ll comment there too. This sounds really exciting. I think it could help us with one of our current problems. Our loading routine needs to call GL commands and takes some time. This blocked the browser for several seconds. The native app would display a progress bar but this didn’t work with WebGL as there is no swap buffers command. I guess this should work now with a WebGL proxy.